The SE-MHR5's may have all the functionality of a high-end pair of headphones, but their poor sound quality make them hard to recommend. Headphones are a ridiculously personal choice. Some people like them small and portable, and don't mind the effect this might have on comfort or sound quality. Others want them big enough to completely sit over the ears with no discomfort, and don't mind about having to lug around a bulky set of cans. Don't even get me started on personal preferences about the way headphones sound, from bassy brutes through to much more neutral pairs. All this is a long-winded way of saying that Pioneer's new SE-MHR5s felt for the longest time like they were a pair of headphones made for someone else. They're bulkier than I prefer my headphones to be, but this doesn't offer any of the usual benefits of size, such as more nuanced sound or increased physical comfort. The SE-MHR5's are a stiff pair of headphones. The headband connecting the two cups is reassuringly solid and feels like it could survive a few knocks and scrapes. This solidness extends to the ear cups which have a hard edge on them as opposed to the more rounded designs from the likes of Beyerdynamics. Between the cups and headband is a small rose-gold accent which is likely to divide opinion. A simple Pioneer logo adorns each cup, which is black and finished with a spiral texture that I weirdly couldn't stop running my fingers over. Personal oddities aside, the sturdiness of the band meant that the ear cups felt as though they were being held on my ears by the strength of the band rather than sitting on them lightly. This wouldn't be a problem if these headphones were of an 'over-ear' rather than 'on-ear' design, but because they sit on the ears, they became uncomfortable during prolonged use. The trade off between on-ear and over-ear headphones is usually that while over-ear headphones are more comfortable, they tend to be more bulky to allow them to completely cover the ears without putting any pressure on them. 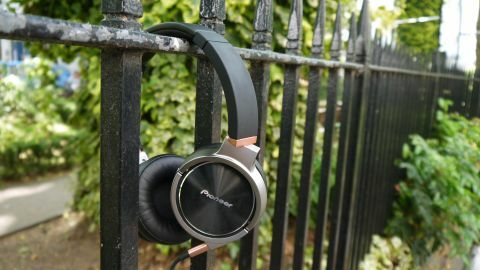 Annoyingly, while the Pioneers sat on, rather than over, my ears, they are still a bulky pair of headphones that I felt more at home using while I was sitting at my desk rather than using while out and about. I did like the detachable cable, which should mean that you won't have to replace these headphones if the lead breaks after a couple of years of use. Nicely the lead is keyed on the headphone end, allowing you to rotate it slightly after plugging it in to secure it in place. This means that the lead is unlikely to be pulled out accidentally from your headphones. Two cables are included, one standard and one balanced, which you can tell apart by the number of black lines on the plug at the end of the lead. Two black lines is the standard cable, while three can be found on the balanced one. Balanced headphones are generally thought of as offering a superior sound quality through doubling slew rate and voltage swing power, reducing THD distortion, and almost eliminating crosstalk. That's a lot of technical information, but all you need to know is that when correctly used balanced headphones result in a clearer, more focussed sound, and more expansive soundstage. If you have the option of using the balanced headphone cable then you should do, but unfortunately you'll need a balanced headphone amplifier to do so. If you don't know whether your headphone amplifier is balanced or not, or if you're using the standard headphone jack on your phone or laptop, then you probably can't use balanced headphones and should stick to using the cable which has just two black lines on its jack. Full disclosure: I don't own a balanced headphone amplifier and was unable to test this functionality of the MHR5's. Both cables feel reassuringly thick and durable, and the jacks on both were slim enough to fit through my phone's case. They also only need to plug into one side of the headphones, which cuts down on cable tangling by a surprising amount. Finally, these headphones are closed-back, meaning sound has a tough time leaking out and disturbing those around you, and likewise they're great if you want to drown out the noise of your commute or co-workers who are arguing for the umpteenth time about whether it's possible to 'meet' a baby (which, for the record, it is). They don't quite have the power of noise-cancelling headphones to eliminate background noise, but the thick memory foam padding on the cups does an admirable job nonetheless. When you actually get into listening to some music with the Pioneer SE-MHR5's you'll find their 40mm drivers to be something of an acquired taste. I conducted my listening tests using Tidal's hi-fi quality streams, and listened to music both with and without an Audioquest Dragonfly Red acting as a DAC and headphone amp. The SE-MHR5's have a high impedance level of 45 ohms, which can make a headphone amp a necessity. Throw on some hip-hop such as Kendrick Lamar's fantastic 'untitled 02 | 06.23.2014.' and the bass takes over the track. It's got a nice well-defined kick to it in a musically simple track like this, and really works to drive the song's rhythm. Switch to a more musically complex Lamar track like 'untitled 03 | 05.28.2013' however and a lot of the subtlety in the mids is lost. These headphones suit a four-piece rock band like The Red Hot Chili Peppers even less. The mids in Especially In Michigan off of Stadium Arcadium gets taken over by Chad Smith's drumming and Flea's bass, leaving the guitar track to get more or less buried in the mix. Classical tracks such as the Overture from Mozart's Marriage of Figaro fare better due to their relative lack of bass compared to pop music. This track allows the soundstage of the headphones to feel much more open, it's just a shame you have to listen to a relatively bass-free track to really appreciate it. Depending on you music preferences you might find a great deal to like about Pioneer's SE-MHR5 headphones. They offer a bass level that's tight and punchy, and this sometimes works in a track's favor. The Pioneer SE-MHR5s are solidly made and feel like they're built to last. The detachable cable is very well integrated, and I liked that the headphones gave the option of using them in balanced mode with a compatible headphone amplifier. The fit of the headphones leaves a lot to be desired, with ear cups that are tight and grew uncomfortable with prolonged use. Their balance of sound, with its strong emphasis on trebles and bass, is very biased towards certain genres of music. The SE-MHR5's are sturdy and offer impressive passive sound isolation, but wear them for a long time and they become a rather uncomfortable pair of headphones. Couple this with sound quality that likes to throw bass in your face and what you have is a solid pair of cans that are an acquired taste for $300 (£199).